If you have decided to grow your own food but don’t know how or where to start, I would suggest – before picking up a shovel – to gather gardening information. I asked myself what I would need to know if I wanted to start all over again and decided that planning is where I would begin. To assist in the planning, I have come up with a basic guide to successful gardening and developed a list of essential decisions and actions that need to be considered. Where to place the garden. Choose a location that will provide the requirements for plant growth. If you do not have an existing garden plot, your first decision must be to select an area that contains the elements that enable produce to grow. Soil. The better the quality of soil you start with, the less time and effort needed to build it to peak performance. Decide how you will fertilize the soil: compost, animal manure, ready-made fertilizers, or other methods. Sun. The plot should receive a minimum of six hours of sun each day to have flourishing plants. Some leafy crops like lettuce can tolerate partial shade but still must have six hours of sunshine. Water. In the form of rain or from a faucet, water must be available. If not enough rainfall exists, a sprinkler or an irrigation system must augment the rainfall. A total of one inch of water a week is ideal. Use mulching as a way of helping conserve water. Beside available water, the soil needs adequate drainage or the plants will “drown”. Warmth. Plants grow with a minimal degree of warmth. A protected area, floating row covers, cloches, and raised beds are helpful in raising crops in early spring and late fall. In addition to these essentials, an ideal garden location needs to be close to the house – to discourage predatory animals as well as for easy access – and needs to be flat to slightly sloping (four degrees or less) to the south or west. This slight slope permits the soil to warm up earlier in the spring and allows you to plant sooner. If space is limited, plant along a walk or driveway, in tubs, or on the patio. There is no iron rule that garden plots must be rectangular. The nutritive content of the food eaten – proteins, vitamins, and minerals – are all derived from the soil. With each harvest the soil is further depleted; therefore, it is important to put back what has been taken out each year. Since I do not use chemical fertilizers, I maintain the quality of the soil in a less expensive way by using ecological methods, such as compost, green manure and cover crops. These methods increase organic matter and nutrients in the soil. Plant Growth requires large quantities of three primary elements: nitrogen (N), phosphorous (P), and potassium (K). In addition, plants need trace amounts of a host of other elements. Soil microbes, worms, and bacteria, which feed on the organic matter in the soil, convert the elements (N, P, and K) to a form that can be assimilated by the plant. Creating the conditions that promote the growth of these organisms is what is meant by “building the soil”. This is done by adding organic matter and by avoiding extremely acid or alkaline soil conditions. Actually, chemical fertilizers do not build the soil. They consist of elements (N, P, and K) that have been treated to render them in a form that can be taken directly by the plants, thus bypassing the soil organisms. Often these harsh fertilizers destroy the soil life. To increase the fertility of the soil, it is important to start making compost right away. Compost contains the whole range of nutrients needed by crops. In three to six months your kitchen and garden wastes can become rich, black compost, teeming with soil life and nutrients. Any poor quality soil can be improved by working in compost and other organic materials. In addition to compost, here are some other ways to replace the N, P, K and other elements in the soil. Animal manure. Manure acts as both a soil conditioner and fertilizer. It is the best all around fertilizer to use as it can be added to the compost pile, applied directly to the garden late in the fall and tilled in as a “sheet compost”, or liquefied to make “manure tea”. Green manure. This is a crop grown in the warm season that is dug under while it is still green and before it has gone to seed. Green manure (buckwheat) and cover crops (winter rye and hairy vetch) are good sources of organic matter and nutrients for the garden. Legumes. Plants such as peas and beans planted in rotation throughout the garden add nitrogen to the soil by the bacterial action on their root system. This bacterial action collects nitrogen and stores it for later use. Seaweed. An excellent source for trace elements is seaweed. If you cannot gather it where you live, it would be good to purchase a supply from a garden shop. Seaweed is available in liquid or powder form. Grass clippings, poultry feathers, bloodmeal, and fish scraps are high in nitrogen. Wood ash is an excellent source of potassium in the form of potash. A word of warning, however: use wood ashes sparingly because too much will cause an imbalance in the soil chemistry. Have the soil tested and check the pH level. Ideally, building the soil should begin with a soil test, which will indicate the type of soil (loam, clay, and sand), the pH level (acid or alkaline), the organic matter contents, and the existing amounts of each vital nutrient. This test is available through your local agricultural extension service. Any nutrients that are deficient should be added before planting. Determining the pH level is very important since vegetable and fruit varieties have differing needs. If the pH is too low (acidic) or too high (alkaline) it must be adjusted to get maximum plant growth. Most vegetables do well with soil pH in the 6.3 to 6.8 range (slightly acidic). To raise the soil pH, add lime or bone meal. Sulfur will help lower the pH. These materials are best added in the late fall or early spring because it takes a few months for the pH level to change. There is no way to match the value of organizing and planning your garden beforehand. What and how much to plant? Which crop and variety to be grown? How much land is needed? 1) Perhaps the most time-consuming decision to make each year is “what to plant?” To accomplish this requires knowledge of the vegetables and fruits under consideration. Information in seed catalogs is a big help. Operating within the constraints of climate, available space, time, and human energy, you must balance preferences with growing requirements. Selections must be made of early and late varieties, whether to extend the growing season, and foods that store well. If space permits, include herbs for their use as condiments. 2) Another difficult decision is “how much to plant?” One way to approach this is to estimate the annual quantity of each food needed, determine the area required producing the desired yield, and check this figure against the space available. Be sure you have considered the amount of people you would like to feed. 3) How will the crops be cultivated? What tools are needed? Do some crops need special care? For instance, blueberries need acidic soil in order to grow. Wherever they are planted, the soil has to be tended differently from other soils close by. Is there sufficient time and labor available? Don’t take on too much and become discouraged. It’s important to pace yourself and set realistic goals. 4) Calculate the total garden area needed. Decide the type of rows or beds used and how they will be planted – wide rows, raised beds, and succession planting (every 2 or 4 weeks). What will be the size of the path between the rows, and where will the perennials be planted? The quantities of seeds to be purchased need to be calculated. Seed catalogs will give specific information for each crop. As you study the seed catalogs in order to decide what to plant, you soon come to appreciate the advantage of the hybrid varieties. They have better production rates and disease resistance than their open-pollinated (non-hybrid) cousins do. The one big disadvantage for the gardener is that hybrid seeds are only available through seed companies or in stores. If you want to save and reproduce seeds in the home garden non-hybrid seeds must be used. Each year I order a few more seeds than needed. I always have a small surplus handy just in case there is space to put extra seeds in the garden or something fails and needs to be replanted. Most seeds will keep for a few years if properly stored. I do not use seeds that are treated with Captan, Thiram or other fungicides because the seeds need to be handled carefully with rubber gloves. If you do not protect yourself, the fungicide will be absorbed in your skin and cause you problems. I always request untreated seeds when I am placing an order in most catalogs, but I try to buy from companies that state their seeds are not treated. Harvesting vegetables early in the spring or in late fall is a gardener’s dream. The ultimate goal for your garden is to produce all the food you want for as long as you want it. You can accomplish this by extending the growing season so there are fresh greens and even tomatoes in the dead of winter. One way to do this is to build or buy a greenhouse. A greenhouse not only grows vegetables out of season but also helps get a jump on spring with early transplants, such as tomatoes, pepper, and eggplants. Other cold-weather devices for extending the season are a cold frame, a hotbed (cold frame plus fresh manure – lots of it), cloches, and floating row covers. The cloches and floating row covers serve as mini-greenhouse for plants. Early in the spring I plant seeds before they are supposed to go in the ground. I cover the soil and seeds with black plastic and a floating row cover. After the seeds have sprouted, I take the black plastic off and leave the row cover in place until the weather becomes warm. I’m able to harvest my first spinach, carrot, pea, beet, and lettuce way ahead of time. Another way to have early crops is to plant spinach, Swiss chard, kale, onions, and garlic in the fall, mulch or cover them with a floating row cover in the late fall, and harvest them early in the spring. What kind of garden aids do you need? Each year, before planting the first seed, draw a detailed diagram of the garden, show where every crop will be located and the quantity to be planted. Make three separate diagrams – for the spring, summer, and fall gardens. 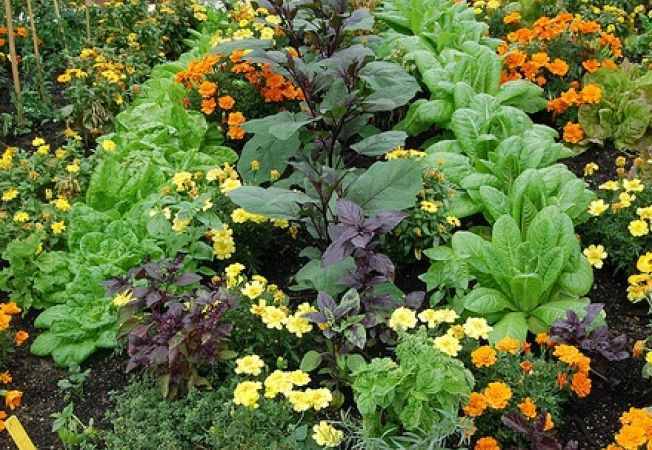 Indicate which crop will have staggered plantings (for example, I plant lettuce every two weeks throughout the growing season – with the use of shade clothe in the summer). Note succession plantings, such as spinach in spring, beans in summer, and peas in fall all grown in the same raised bed. Determine the planting techniques to be used – raised beds, wide rows, or intensive gardening. Show the spacing between rows and between plants in the rows. These diagrams become the working blueprints throughout the season, complete with a schedule of activities. 2) The other invaluable planning aid is my record of notes from previous gardens for crop rotation. 3) Allow some time each day during the season to check the garden’s progress – weeding to be done, crops to be harvested, evidence of pest infestation, indications of disease, plants that have finished producing and need to be replaced, and areas that need to be watered, fed or mulched. 4) Observe what is going on in the garden and keep a log. Jot down simple notes based on your observations. These will serve to guide next year’s efforts. Shovel or spade for turning up the soil. Reisch hoe (pointed hoe) for making furrows or cultivating between plants. Metal garden rake for thinning, seedbed preparation, leveling and removing rocks. Trowel for digging planting holes for seedlings. Pitchfork (3 tines) or a straw fork (5-6 tines) for picking up, turning, and scattering hay mulch, leaf mold, and light compost materials. Wheelbarrow for transporting things to and from the garden. You might want to invest in a rototiller or even a garden tractor for larger gardens.